When you are about to buy a web hosting plan, you can either go for a monthly plan or a yearly plan. Though you can save some money by going with an annual plan, there are some situations when you don’t want to buy the annual plan. Here are the situations. You don’t have enough money to invest on the yearly plan. You are not sure whether you will be running the blog/site or not in future. You may need to change the hosting provider after few months. These points work practically in favor of once-a-month payment. Besides, if you get stuck in a year-long payment, you don’t have any other choice but to continue with the same hosting company. So it’s better to go with monthly web hosting plan in some situations. 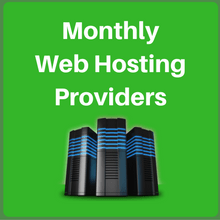 Not all the top web hosting companies offer the monthly plan. Here I’ll be sharing a list of 10 best web hosting companies that accept month to month payment. 1. HostGator – Get First Month Hosting For Just $0.01! HostGator is one of the most famous web hosting providers that offer monthly web hosting plans. It’s so confident about its services that it offers the first month hosting for only $0.01. 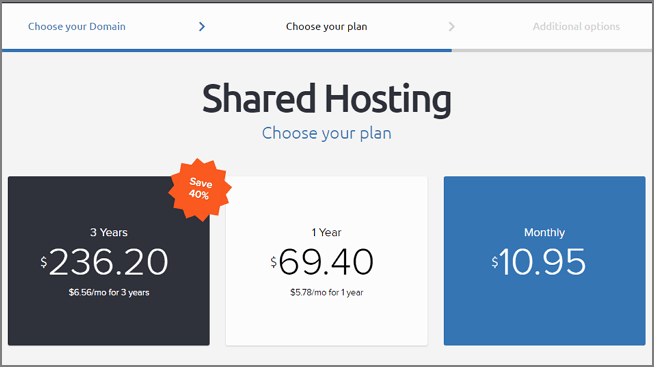 That means you can buy HostGator hosting plans with features like unlimited domains, unmetered bandwidth, one click installs, etc for only one cent. All you have to do is, use the coupon “HL1CENTHOSTING” while signing up. To get HostGator monthly hosting, select 1 month from Billing Cycle when you are in “HostGator Order Form” page. You can buy HostGator hosting via PayPal or Credit Card. A2Hosting offers high speed, consistency, and backing for beginners who are starting their first venture. The Turbo servers of A2Hosting will make your site 20X faster. You can avail the facility of free account migrations with easy to use control panel. A2Hosting allows one-month web hosting. Just choose 1 Month from billing cycle. It costs $9.99 per month. You can pay your bill through Credit Card, PayPal, 2CheckOut, Check or MO, Bank Transfer, Skrill, PayULatam (Argentina, Brasil, Colombia, Mexico, Peru), CCAvenue (India). DreamHost is an award-winning web hosting company that has been in business since 1997. This web hosting service is a right choice for eCommerce websites, personal blogs, startups, or any other sites. It offers month to month web hosting with a free domain name. DreamHost offers 3 type of plans which include 3-year, 1-year and monthly payment plans. The month-to-month plan starts at $10.95. You will have right to use to almost all the features except a unique IP address. You can pay your bill via Credit Card. ASmallOrange is a reliable and affordable web hosting company. It offers advanced server hardware. All the service plans include WordPress optimized servers along with Weebly cloud hosting for simple site building options. It month-to-month services include almost all the highlights of the service. Some of the features are not included in monthly plans including free domain names and unlimited website access. ASmallOrange provides 4 types of services –Tiny, Small, Medium, and Large. The month-to-month plan starts at $5, which is quite affordable for newbies. The Tiny plan doesn’t support. You can pay your bill through PayPal or Credit Card. The consumer-oriented interface of Site5 assists you in managing all the aspects of your hosting account. The monthly plan of Site5 is expensive than other service providers and cost $10.95 or $13.95 per month according to the plan you select. The hostBasic plan does not offer month-to-month payment system while other two plans Pro and Turbo support it. The Site5 provides you all the salient features of the hosting service in month-to-month payment option. You can also avail yearly or two-yearly paying option in hostPro and hostPro+Turbo plan. You can choose monthly option at the time of payment. You can pay the bill via Credit Card or PayPal. JustHost provides you world-class experience with all the enhanced features in your budget. It is managed by Endurance International Group which operates hosts like HostGator. It has unlimited data transfer and domain hosting along with zero setup cost and instant site builder. It offers monthly web hosting plans that $7.99 per month. JustHost accepts Credit Card and PayPal payment. With GreenGeeks, you will get hundreds of unlimited features along with fully loaded web hosting plan in a budget. It has multiple site building and marketing tools. Secure and technically advanced hosting services will add up to its attributes. Its monthly plan is costlier than others. It has a single plan with all the added features in it. This plan is inclusive of all the unique attributes offered at a great discount. GreenGeeks accepts Credit Card and PayPal. With eHost, you can get valuable full-featured services providing a single web hosting plan. The plan combines powerful control panel along with Ad credits and CMS tools for building a beautiful website. eHost provides a single plan worth $100 Value features. At the monthly cost of $2.75, the website provides superior quality built-in templates and SEO tools. The plans divide into 3 types namely, Design, Marketing, and Support Suites. eHost accepts Credit Card or PayPal payment. Arvixe is another enhanced web hosting company with no hidden cost in their plans. With unmatched trustworthiness, class, and affordability, Arvixe is one of those best performing hosting company. It gives you the automatic setting of accounts once you are done with final billing. The plans are divided into two categories namely- Personal Class and Personal Class Pro. For month-to-month payment, you need to pay $7 in the case of PC plan and $10 in PCP plan. There is no compromise on the quality features provided by the company. You can make your payment via PayPal or Credit Card. At Hostwinds, the customer will be provided with fast servers and properly managed accounts. This web hosting service provides quality aspects at low prices along with no downtime and excellent customer support. There are three plans namely- Basic, Advanced, and Ultimate. All three have 4 types of payments system of 1, 3, & 6 months and 1 year. For month to month cost you need to pay $6.50 (Basic), $7.50 (Advanced) and $8.50 (Ultimate) in respective plans. Available payment methods are Credit Card, PayPal, Skrill (MoneyBookers), and Bitcoin. So start with your own website with the month-to-month plans. Now you know very well about all those web hosting services which provide you periodic payment facility in your budget. If you know any other companies that accept month-to-month payment system, then please let us know in the comments below. Which caching plugin are you used on HostLater.com?